As far back as 3,500 years ago ancient Egyptian doctors were performing invasive surgeries. Even though our tools and knowledge have improved drastically over time, until very recently surgery was still a manual task for human hands. When it came out about 15 years ago, Intuitive Surgical’s da Vinci surgical robot was a major innovation. The da Vinci robot helps surgeons be more precise and dexterous and to remove natural hand tremors during surgery. 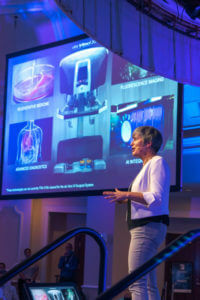 “We’re on the verge of what we might call the second wave in surgical robotics,” said Catherine Mohr, vice president of strategy at Intuitive Surgical, while speaking at Singularity University’s Exponential Medicine conference this week. Mohr believes this new wave of innovation will be characterized by the convergence of surgical robotics with AI and data gathered from robotic systems. Surgery is about to get “digitized.” We’ll start collecting and analyzing data passing through these robotic systems, like motion tracking. “Once we can turn something into data, then we can start making exponential changes,” Mohr said. China is currently on track to have a million lung cancer deaths a year. Lung cancer is surgically treatable, but only if it is found fast enough. And too often we’re not finding it fast enough. Mohr says the problem of lung cancer detection is just calling out for robotics. Currently, surgeons use a pre-operative image to search for cancer to remove, but the lungs are a moving target. So, to get to the cancer, surgeons deform the lungs on the way in and again on the way out because they are taking a different path. With surgical robotics, you can track the path in and use that same motion tracking data on the way out. We’re also on the cusp of starting to incorporate various AI systems into surgical simulations and procedures. Mohr listed three types of AI she’s personally interested in incorporating into surgical procedures. IBM Watson: Watson is an expert-system type of AI. Watson can store more medical information than any single human can store and and give responses to natural language queries from surgeons. Watson (or AI like it) will become an intelligent surgical assistant. In closing, Mohr sketched out this next wave of AI and robotics in surgery as a tight partnership between humans and machines, with one making up for the weaknesses of the other.